Nearly one-third of the world's power sources are now made up by renewable energy technologies, accounting for nearly a quarter of its electricity production, according to a new report. The report, published by the World Energy Council (WEC), used information from 32 country case studies, representing about 90% of installed wind and solar capacity worldwide. Renewables, including hydroelectric power, account for about 30% of the total global installed power generating capacity, and 23% of total electricity production, the report stated. 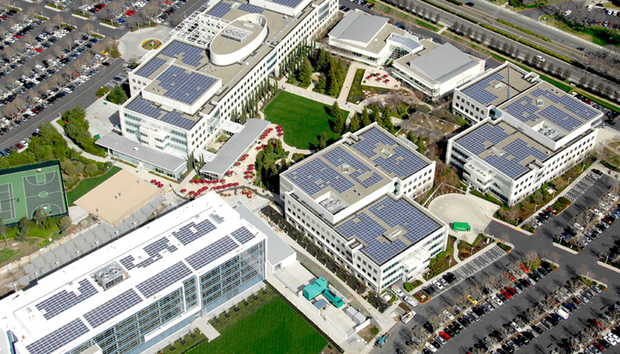 London-based WEC is a 92-year-old organization whose mission is to promote sustainable energy. It has more than 3,000 member organizations in 90 countries, which include governments and members of industry. 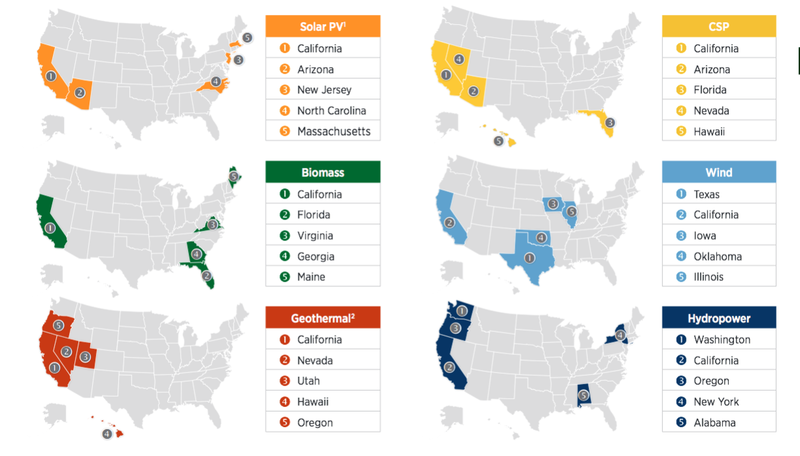 Top renewable energy installations by state. "Over two decades ago, the world's electric power sector began its transformation from a highly centralized and integrated industry that was mostly state-controlled towards a more efficient and lean business model, including private ownership," the report stated. "Mounting concerns about global warming and the role of the energy sector require the industry to adjust to the realities of operating in a new carbon-constrained world." Last year, WEC's report noted, a record $286 billion was spent installing 154 billion watts (gigawatts or GW) of new renewable capacity worldwide, and 76% of it was represented by new wind and solar power, the report noted. Wind and solar installations, by far, overtook investments in conventional power-generating facilities, such as coal-fired power plants, which accounted for just 97GW of new energy installations. "In the last 10 years, wind and solar... have witnessed an explosive average annual growth in installed capacity of 23% and 51% respectively, although their combined contribution to the global electricity production is around 4%," the report stated. The bulk of renewable energy capacity remains hydroelectric power from dams, the report indicated. Driving an uptick in renewable energy deployments were regulations supporting new energy technologies, as well as increased volatility of oil prices where an era of high oil prices over a longer period of time was followed by a drastic collapse in 2014; that, combined with increased tensions in the Middle East, Latin America and Russia, influenced all fossil fuel prices, the report said. Additionally, "the shale gas revolution" in the U.S. reduced coal demand for electricity production and increased the use of gas, leading to growing exports of U.S. coal at low prices. In addition, the Fukushima nuclear accident in Japan "has practically stalled future development of nuclear power in many countries." The report noted that in 2015 the majority of nations around the world had implemented policies that support the growth of renewable energy, and of 164 countries that have those policies, 95 of them were developing countries, compared with 15 in 2005. "There was a general market shift from developed countries to emerging economies. China alone accounted for 36% of global renewable energy source investments," the report stated. 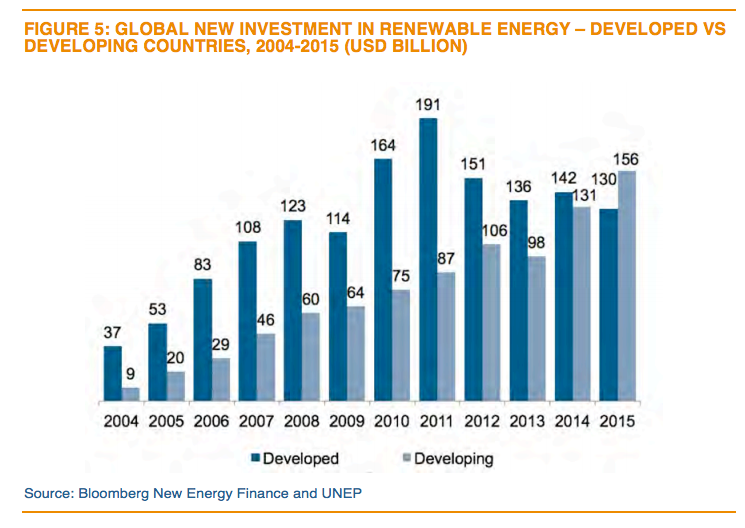 In developed countries, the 2015 renewable energy investments reached $48.8 billion in Europe (21% less compared to 2014), $44.1 billion in the U.S. and $36.2 billion in Japan. For the first time, the researchers said they were able to document the consequences of nations reducing renewable energy subsidies and other incentives. Over the past four years, as the European Union decreased renewable energy subsidies, its share of global solar PV installed capacity plummeted from 75% to 41%, and the share of wind power dropped from 41% to 33%. In 2014, for example, German lawmakers made major revisions to the country's Renewable Energy Act to curb subsidies by limiting how much wind, solar and biomass could qualify. "This decrease was not fully matched by increasing investment in developing countries," the report stated. 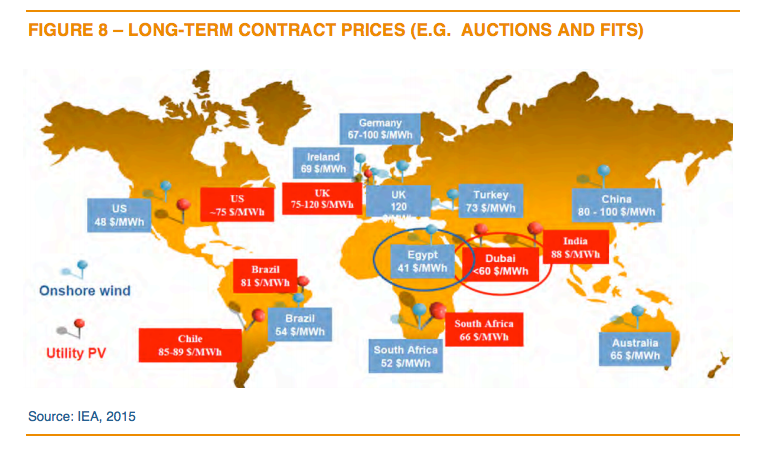 Conversely, the combination of improved renewable energy technologies and cost reductions has driven down capital expenditures and operational costs, particularly for solar photovoltaics (PVs). 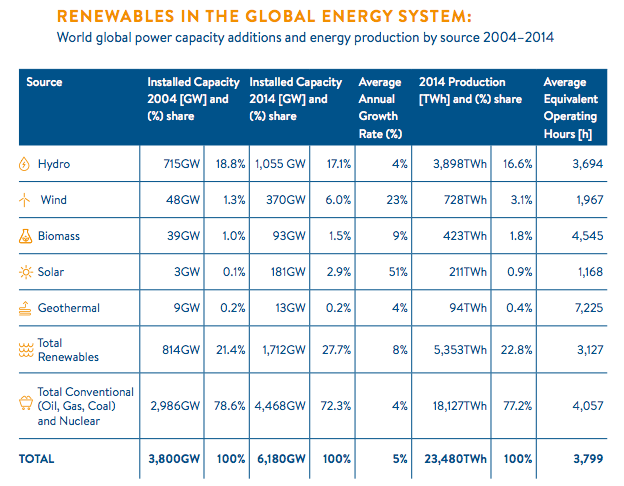 Challenges to renewable energy deployment, however, remain. For example, ensuring wind and solar power are deployed in the most effective locations (where consistent wind and sunlight dominate), and efficiently integrating that power into existing grid systems continues to be a challenge. Burlington, Vermont, is one of a handful of U.S. cities that have already proclaimed 100% renewable energy use. Above is a 500kW solar array on the roof of the Burlington International Airport parking garage that began commercial operations in February 2015. Effective and affordable technology, such as more sophisticated weather forecasting and better energy storage systems (i.e. battery and other technologies) will help decrease or eliminate the challenges. "Appropriate policies, including regulation and market design play a fundamental role in both development of variable renewables and their efficient integration in electricity systems," the study stated.